A new marine biodiversity study in one of the largest Marine Protected Areas in the world reveals the impact of environmental change on subantarctic seabed animals and answers big questions about the extent of South Georgia's ice sheet during the Last Glacial Maximum around 20,000 years ago. Reporting this week in the Journal of Biogeography researchers at British Antarctic Survey (BAS) describe how colonies of seabed creatures, such as sea sponges - that play an important role in absorbing and storing carbon from the atmosphere - can take thousands of years to recover from major glaciation events. A key ambition for the study was to use biology to investigate two conflicting theories about the extent of ice cover during the period when the ice sheet was at its greatest extent. Whilst some researchers estimate the sheet was largely confined to fjords around the subantarctic island of South Georgia, others suggest it could have extended across the continental shelf. This new study suggests an intermediate cover. The ice sheet probably extended over most of the continental shelf (covering an area of 40,000km2), but some of the eastern sector and troughs in the shelf appear to have remained ice free. There is evidence that seabed creatures survived in the ice-free zones whilst in other areas they were removed by grounded ice. The scientists used an underwater camera lander and a trawl to survey seabed fauna around the continental shelf. They found the fauna was richer at the edge where the advancing ice sheet had transported boulders, rocks and sediments (areas known as moraines). This process could have potentially bulldozed all seabed life off the continental shelf. Only animals at the outer edge, on these moraines, were able to survive. "Biology can tell us a lot about ice sheet extent during the last glaciation and the survival of ocean ecosystems. Remarkably it seems that most seabed species, especially the less mobile ones, have not moved far back to recolonize the coast the inner shelf and coastal areas despite having thousands of years to recover. Only the more mobile species such as Antarctic sea spiders and brittle-stars have managed to make their way back. It is reasonable to conclude that most of the continental shelf is still undergoing recolonisation 20,000 years after the grounded ice started to retreat." 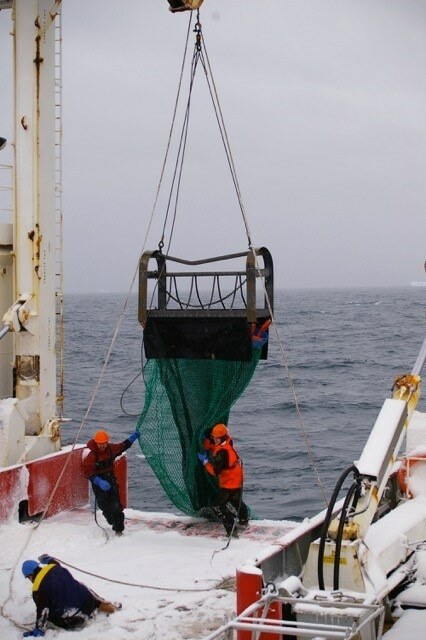 "This study gives us a clearer understanding about this important Southern Ocean ecosystem. This subantarctic region is biologically diverse and an important habitat for rare and endemic species. Long-term conservation monitoring plans will benefit from this new knowledge."